These heads are not especially good shapes – the muzzle on the left could be ‘filled’ a little more at the cheeks and that on the right has too short a muzzle, a slightly ‘roman’ nose and the forehead is too domed with the skull itself too flat- but you can see the idea . This head is what we are looking for. This dog also clearly shows the pitch black nose that is a fundamental characteristic of the breed. Dogs that have a patch or pink nose should be disqualified. 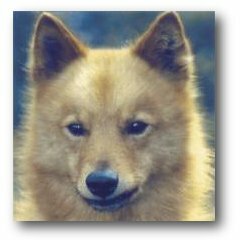 The breed’s ‘nick name’ in Finland is ‘pikinokka’. It mean ‘pitch black nose’ and the Finnish view is that with out it – it is not a Finnish Spitz. The lips should be narrow and tight. There should be no slack in the flew. Birds should be recovered ‘dry’ unless it is raining or the dog has to swim – a not uncommon occurrence. The mouth should have a tight scissor bite with strong, straight teeth. . 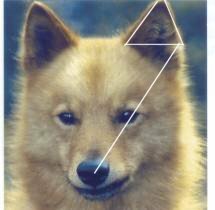 The eyes in this dog are beautifully shaped, exactly in proportion to the skull, They should be almond shaped and slightly oblique. They should not be full or round. And they must be dark – the standard says ‘preferably’ but this is not designed to give much leeway. However, shape is more important than colour although this should not be an excuse for light eyes. The pigment in the surround must be black and the eyelids ‘tight’ to the eye. I am afraid that we see a lot of dogs with expressions similar to these. 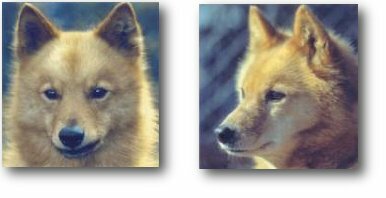 That on the left has eyes that are too large, a short blunt muzzle with the ears too high set. That on the right has a coarse, hard expression, with the large ears placed too wide, and set too far down on the sides of the skull. Of course, heads can be too fine and narrow as in the head on the left. This dog also has a slightly concave muzzle. 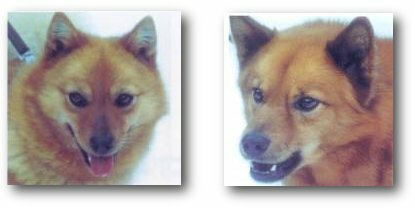 On the right, the muzzle is too weak for the size of the head. The muzzle almost seems an afterthought, added to the head and nor integrated with it. 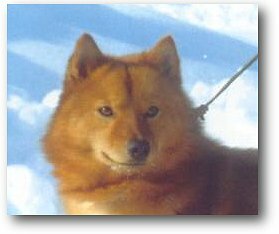 And it has a black chin which is common but not correct – it must be red although some black hairs are forgivable in puppies under twelve months old.